Goonies meets E.T. - that's what Super 8 has been called by many. And, you know what? That isn't far off at all. It's actually almost dead on. 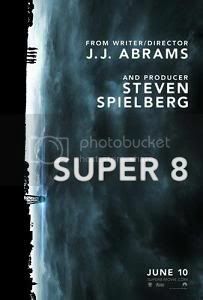 J.J. Abrams, Mr. Lost himself, wrote and directed Super 8, and he did a fine job. In addition to the Goonies and E.T. comparisons one more has to be made - Abrams' own Cloverfield. (OK, Abrams didn't write or direct Cloverfield, but he did produce it.) While Super 8 doesn't directly copy the, "Firsthand video account," of the story, a home movie is a constant thread throughout the movie, and it pushes the story along. For those who may not know, Super 8 takes place in 1979, and follows the story of a group of kids in the midwest who are making a movie for entry into a local film competition. Along the way they witness a train crash that is far more than the mere (!!) disaster that it appears to be at first glance. Something more serious and sinister is involved, and later on the kids find out what that is when they watch the footage of the crash that they inadvertantly caught on film. There are also bits of the James Cameron ALIENS film to be found in the plot of Super 8, as something has escaped from the crash, and people are disappearing. 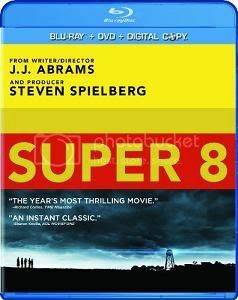 Despite the first rate talent behind the camera (beyond Abrams, Steven Spielberg was also involved as one of the movie's producers), Super 8 is merely a good movie. OK, very good at times, but it never reaches the level of a true classic, and given the plot and the people involved in making the movie that is a bit of a disappointment. The kids in the story spew out a bit too much profanity, and some of the characters are a bit too two-dimensional and needed more fleshing out to seem like real people. Some of the plot points are also meant to surprise to a degree, but are easily predicted mile away. None of that takes away from the entertainment value of the movie, as this is a good movie to watch while eating a bowl of freshly popped popcorn. It is fun, just not as much as it could have been. Another draft of the script might have made for a better film, but that didn't happen. Spielberg and Abrams were clearly happy with the script as it was, and they did make a good movie out of it. Ultimately, Super 8 is fun, escapist fare that hits the spot when an exciting, halfway suspenseful, slightly scary movie is what you're looking for. As for the Blu Ray, the picture quality is (as expected) very good. A lot of it takes place at night, so it doesn't, "Pop," the way some Blu Rays do, but it does have good shadow detail, and the picture is very crisp.